Storage and warehousing of stock or parts are where steel sheds and similar buildings come into their own. A steel framed building means the whole of the inside of the building is available for storage and access with no internal pillars to get in the way. Steel walls are also lighter than brick allowing for taller interior heights. This allows for high-shelving increasing the volume of storage per square metre, or for the storage of tall or bulky objects such as boats or machines. Steel buildings can be built with a variety of door types, with roll-up doors for vehicle access and side and standard access doors for staff and are particularly easy to secure making them perfect for warehouse applications. For warehouses where cost and volume per square foot are the principle business considerations, it's almost impossible to beat the value of a new steel building. Get advice and quotes for warehouses and storage facilities from leading metal-building suppliers in the UK. Just click the Quote Me button below to get started! 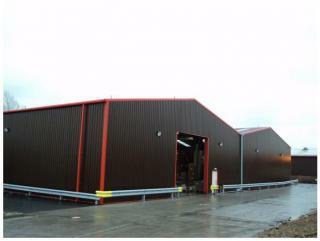 A twin framed simple shed-style warehouse in chocolate steel cladding with red detailing for the guttering. These warehouses were built especially to provide extra height access so that large cranes could enter and leave the storage area and work inside for waste storage and recycling.